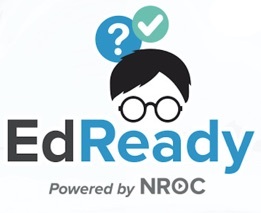 For many EdReady goals, the target score for each scope (study path) is set manually by an authorized administrator or teacher for that EdReady version. In these cases, the target score will be fixed for each scope; students do not have a choice of target scores. For some EdReady goals, students will have the option to choose among different colleges or universities of interest. Each of these schools is associated with a target score that roughly equates to each school's "readiness expectations", as defined by various entrance or placement exams. In this second case, the target scores have been defined by a combination of direct translation from published placement expectations and estimates based on a statistical model. We built the statistical model using the data available from the federal government (http://nces.ed.gov/ipeds/datacenter/) for the 25th percentile SAT® and ACT® scores as our standard for determining readiness for that institution. These scores are recentered on a standard 1-100 (percent) scale to match the EdReady scoring model. We then take the higher of the published scores (if both SAT® and ACT® scores are available) to establish the EdReady equivalent. In addition, we add 10 points to that score (to a maximum of 100) to give greater assurance that the student is sufficiently prepared to meet that institution's expectations. For any remaining institutions for which data are not available, we used the national average for the 25th percentile ACT score (normalized to 53) to establish a target, again adding 10 points (to 63) for the actual EdReady score in force. It is critical to note that these target scores are both estimates and conservative. The scores can also be easily updated as we learn more. If you see a target score that you feel should be changed, please contact us and we can review the score and adjust it as needed.